This bird eye view taken on April 20, shows the 33.9 kilometer Saemangeum seawall in Gunsan, some 200 kilometers south of Seoul. S.Korea on April 27 formally marked completion of the world's longest seawall, the first step in a massive project aimed at reclaiming the ocean for industry, tourism and agriculture by 2020. South Korea formally marked completion of the world's longest seawall on Tuesday, the first step in a massive project aimed at reclaiming the ocean for industry, tourism and agriculture by 2020. The 33.9 kilometre (21 mile) Saemangeum seawall encloses 401 square kilometres (160 square miles) of seawater or tidal mudflats, about two thirds the size of Seoul. "Saemangeum is the largest-ever engineering project in this country and will change the country's landscape," said President Lee Myung-Bak at the televised inauguration. The government has so far spent 2.9 trillion won (2.6 billion dollars) on the project, which began almost two decades ago but was repeatedly suspended amid a lawsuit by environmentalists. Another 21 trillion won in state and private spending is envisaged over the next decade to reclaim land, build infrastructure and create giant freshwater reservoirs. Lee called the structure, which incorporates a road, "the Great Wall on the sea", saying it would become an economic highway for South Korea to reach the world beyond Northeast Asia. Agriculture minister Chang Tae-Pyong said the project would convert mudflats and shallow tidal waters into a centre for low-carbon, green growth industries, leisure, the environment and agriculture. The ministry said it replaces the Zuiderzee dyke in the Netherlands, completed in 1933, as the world's longest seawall. The inauguration of the first phase featured the opening of the road along the top. 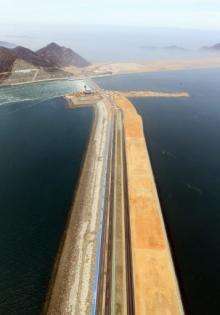 The reclamation project was first mooted in the early 1970s and work on the west coast dyke, 200 kilometres (125 miles) south of Seoul, began in 1991. Originally the government planned to use 70 percent of the reclaimed land for farming but the South Korea's rice production now outstrips demand. The plan now is to build a new city focused on logistics, industry, tourism and leisure as well as floriculture. The reclaimed area and the port city of Gunsan will jointly house an international business complex, to be called the Saemangeum-Gunsan Free Economic Zone, by 2020. The project has been dogged by fears of environmental disaster, and was marked by protests and clashes with riot police. Environmentalists say it will destroy huge mudflats which provide habitats for wildlife and serve as natural water purification plants. Opposition eased somewhat as authorities promised to invest more to address environmental concerns, including tighter control of pollution upstream on the two rivers that flow into the area. "However, the overall development project must be reviewed in order to preserve the mudflats as much as possible," Jee Woon-Geun, a director of the Korean Federation for Environmental Movement, told AFP. "Mudflats enable sustainable development. They are also a great tourist attraction." Lee, quoted by Yonhap news agency, defended the project against claims it would severely damage the ecosystem. "It is another effort by us for low-carbon and green growth, along with the four rivers project," he said, referring to his controversial drive to restore the country's four major rivers. i wouldnt be surprised to see plasma turbines inside producing hydrogen and utilizing tidal power to stabilize it for nuclear fusion in the next few years. Also nature will adapt to what greenery it helps produce. To get full value out of it perhaps they should have built it when the Dutch built theirs.